Harry has always had a thing for hamburgers:How he first came up with the idea of making a round water bed that resembles a giant cheeseburger that might eat you even Harry can't really remember any more. But you might want to check out the youtube video in which he makes an attempt to explain. Like Kayla, Harry wouldn't say that he is obsessed... But he has made the worlds only Hamburger Museum. 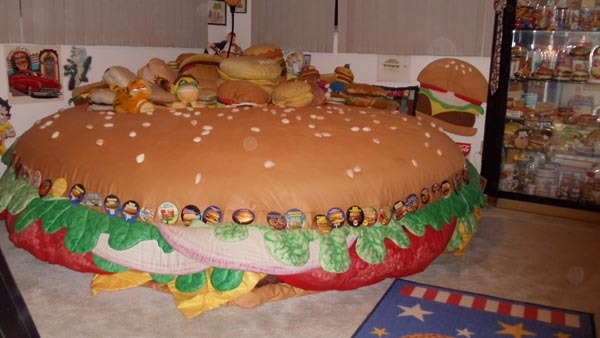 So this fan of the hamburger took every attention to detail when making this bed. For a time it served as Harry's guest bedroom bed. And guests loved the thrill of hamburger slumber. The bed now has a permanent home at the Hamburger Museum and it is glad to be kept company by the Hamburger Harley, and its new friend the Hamburger Bed. © Hamburger Bed 2010 - 2014, All rights reserved.